Gaura Purnima fell on the 1st March this year for the celebration of Lord Chaitanya’s appearance. At the time New Vraja Dhama was covered in thick snow and during dawn the bright light of the moon bathed its rays on Radhe Syama’s temple and abode, giving and enhancing the appearance of a pure white icy covering of diamonds which sparkled and shimmered. It was truly wonderful to behold. When the altar curtains opened at 7am the Pujaris who had been dressing said that the same mood was there too. Due to the extreme cold there has been a power shortage which meant no lighting was available in the Pujari area. So they had one lamp whose light was of a bluish hue which when dressing the Dieties gave the same effect as the moon shining on the faces of Radha Syamasundara. 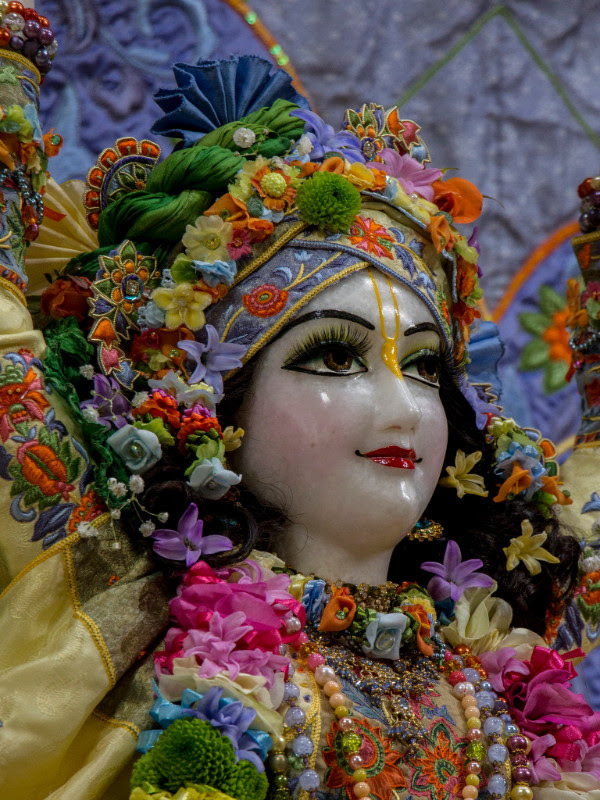 Despite those difficulties darshan time was really beautiful and Radha Syama wore a new outfit with Gaura Nataraja while standing on his lotus in a flower kunja, showered his blessings on all of the devotees. We spoke about Lord Chaitanya’s pastimes, we chanted, and there was an abhisheka offered to Him along with more chanting and katha. 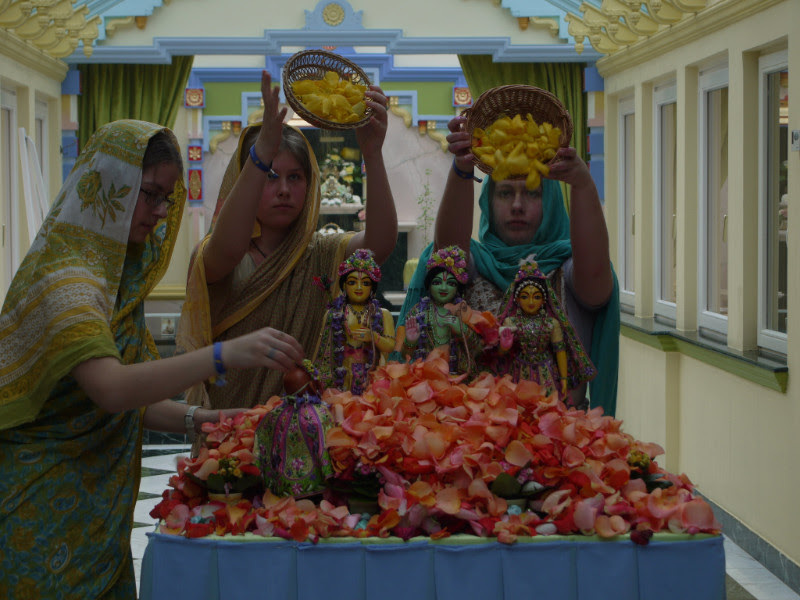 Then a few days later on 4th March the celebrations were continued in Budapest where again abhiseka was offered, but this time to Dayal-Nitai and Vijaya-Gauranga along with Caitanya katha, rousing kirtans and enthused bhajans. A local drama group performed a colourful addition to the normal program with a play especially for the festival, which was very successful and enjoyed by everyone. 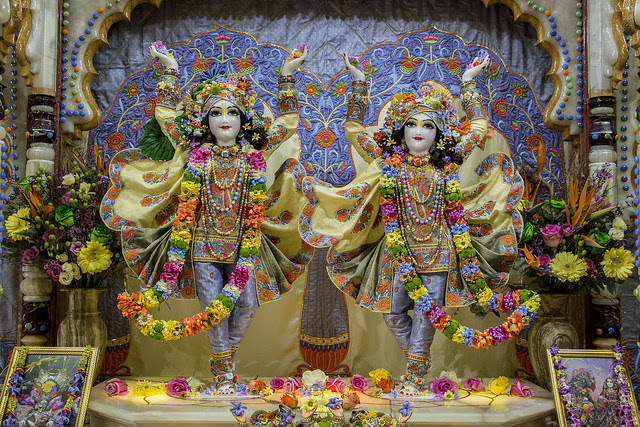 How gorgeous and wonderful Gaura Nitai looked too which you can see by Their darshan photos here. 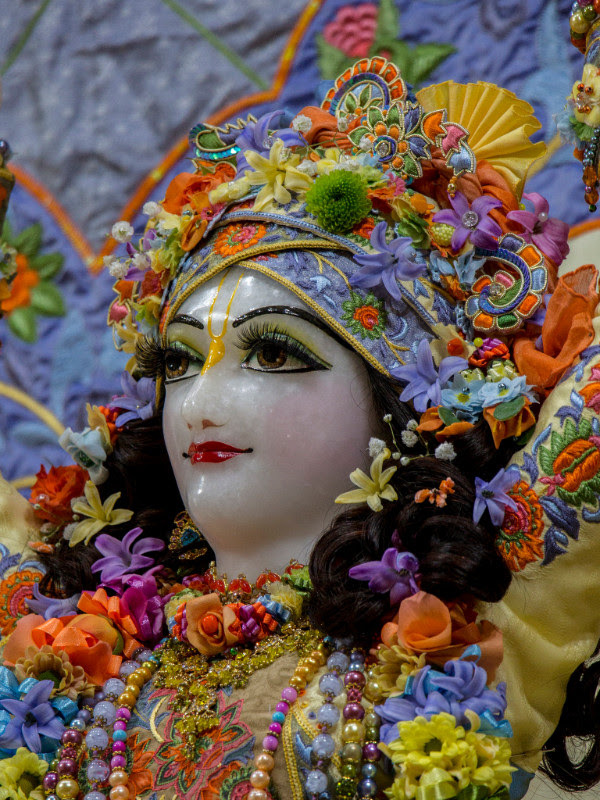 A little more than three weeks later we had another festival in Krishna Valley this time on the occasion of the appearance of Lord Ramacandra and we had such a celebration like never before! A pushpa abhishek for the pleasure of Sri-Sri Sita-Rama-Lakshman and Hanuman was held for the first time! 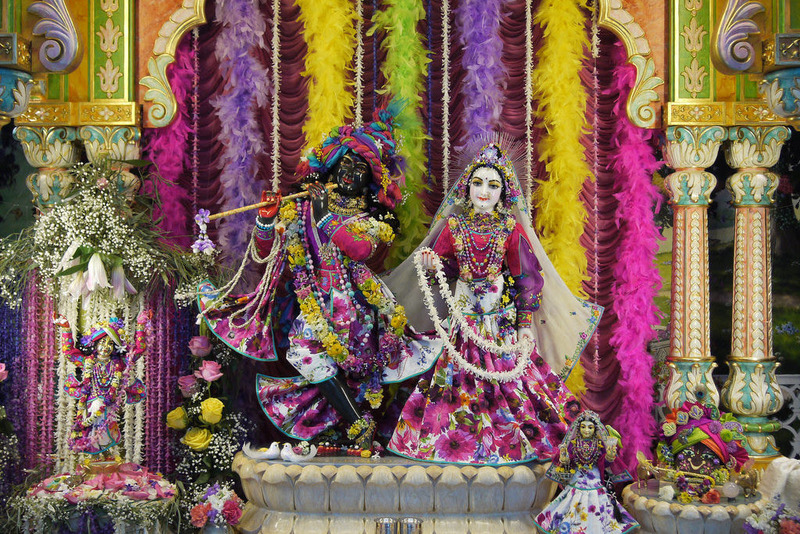 The devotees were spellbound watching how the colorful flower petals were cascading and gradually covering Their Lordship’s transcendental bodies. We are hoping we can do a similar offering for the pleasure of Radha-Syama and Govardhana-lal during one of Their upcoming festivals! We had one family this month registering for a full Nitya-seva payment and three other devotees including families who also joined the team of the Nitya-seva donors by paying the full amount in instalments. We would like to thank them very much along with everyone else too, who are regularly sending their donations for the pleasure of Radha-Syama and Gaura-Nitai! Many devotees timed their registration emails or their first Nitya-seva payments for the 30th March, the appearance day of His Holiness Sivarama Swami Maharaja. This was to please him by contributing towards his mission in collecting the necessary funds for ensuring the future worship of our beloved Lordships Radha-Syamasundara and Dayal-Nitai Vijaya-Gauranga! Please don’t forget that we only have a little more than three weeks left until this year’s first two big festivals in New Vraja-dhama begin! On 28th (Saturday) and 29th April (Sunday) we are looking forward to seeing you all for the Nrisimha Caturdasi festival and Sivarama Swami Maharaja’s Vyasa-puja celebration! Please come and join us for the pleasure of Radha-Syama and Laksmi-Nrisimhadeva by serving and chanting Their glories together! Finally let’s have a look into April’s Nitya-seva calendar, where the following dates are still available: 2nd, 4th-7th, 9th,13th-17th and 21st-23rd.